In the wake of historic destruction wrought by Hurricane Sandy in 2012, residents of New York and other coastal cities were left wondering whether Sandy-scale storm floods are the new normal. Now, researchers from Princeton and Rutgers universities and the Woods Hole Oceanographic Institution have developed a computer simulation that estimates that storm-related flooding on the New York City coastline similar in scale to those seen during Sandy are likely to become more common in coming decades. The worst-case scenario has the frequency increasing by 17 times by the year 2100, according to predictions scheduled for publication on Oct. 10 in the Proceedings of the National Academy of Sciences. Beyond this particular prediction, the new model provides an important new tool that can predict, more accurately than previously possible, the kinds of storm floods that will threaten coastal cities over the next century. The new simulation promises to provide a picture of long-term coastal flood risk by accounting for both sea-level rise and varying storm activity due to climate change. Scientists call flooding associated with coastal storms "surge floods," referring the rise of coastal water due to storm surge (produced by a storm's pressure and wind forces) and sea-level rise. "To effectively prepare for future hurricanes, we need to know what coastal cities will be facing in the coming decades, but past models have not accounted for all of the significant dynamic factors involved in predicting surge floods," said Ning Lin, the lead author of the paper and a Princeton assistant professor of civil and environmental engineering. "You need numbers to plan, and this analysis puts sea-level rise and storm surge climatology together on a quantitative basis." Hurricane Sandy was the second costliest hurricane in U.S. history, in large part because the high storm tide — the combined height of the normal ocean tide and the storm surge — flooded large swaths of New York City and the New Jersey coastline. As the storm moved inland, it pushed a wall of water in front of it, causing the East River to overflow its banks and pour into Lower Manhattan, inundating streets, buildings and subway tunnels. The storm caused an estimated $71 billion in damages and resulted in 157 deaths in the United States. Government agencies such as the U.S. Federal Emergency Management Agency and state emergency management and planning agencies are exploring how best to minimize the damage from future Sandy-like storms. For instance, the U.S. Department of Housing and Urban Development has plans to build an enormous berm and walled park around low-lying areas of Manhattan along the East River as a bulwark against future storms. "Your mitigation measures are only as good as your predictions of the threat you're trying to mitigate," said Lin. "Engineering-wise we've always considered sea level and climate as static, but now we need to account for the change over time. Our work is focused on putting predictions of flooding on a truly quantitative basis by incorporating factors that are predicted to change. If you don't account for rising sea level and possible change in storm activity, you're underestimating future flood risk." 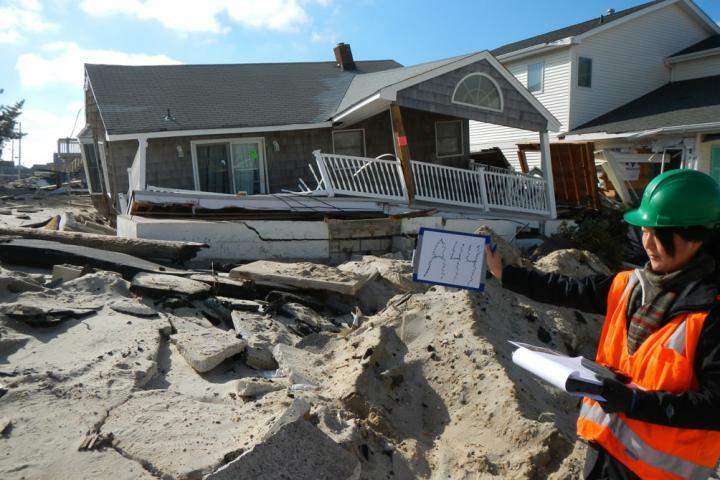 In their study, Lin and her colleagues used their new model to estimate past and future Sandy-like flood events in New York City. They based their estimates on historic data and combined predictions of sea level and peak storm surge height generated by several climate models including those used by the National Oceanic and Atmospheric Administration. "Our model for the first time pulls together probabilistic estimates for sea-level rise and storm surge to produce long-term predictions of flood stages," Lin said. "These two variables, although largely uncertain, are critical in determining the extent of coastal flooding from future hurricanes." Using the new model to look back in time, the researchers found that due to sea-level rise alone the frequency of storms producing Sandy-like surge floods increased threefold during the two centuries from 1800 to 2000. Looking forward, again based on just sea-level rise, they found that such surge floods will become 4.4 times more frequent between the years 2000 and 2100. Sea-level rise results primarily from the expanding volume of ocean water due to rising global temperatures and melting of the glaciers and ice sheets. "The grand answer is that things are going to get worse by 2100," said Benjamin P. Horton, who is professor of Marine and Coastal Sciences in Rutgers' School of Environmental and Biological Sciences. "If nothing changes with hurricanes, sea-level rise alone will increase the frequency of Sandy-like events by 2100." When they also incorporated predicted changes in storm climatology, the model estimated that Sandy-like surge floods would become at least 3 times to as much as 17 times more common. "What this tells us is that large surge floods are likely to increase in frequency, but that there is a large amount of uncertainty about the extent of the increase," Lin said. The researchers noted that every Sandy-sized storm surge doesn't necessarily equate to flooding like that seen during Sandy, which also happened to hit during a particularly high astronomical tide (the tide due to the gravitational pull of Earth's moon). The summation of the storm surge and the astronomical tide is called the "storm tide," the total height of the floodwaters. A hurricane that produced the same size storm surge as Sandy, but that peaked during a low astronomical tide might not cause the same catastrophic flooding. "The effect of astronomical tide will be accounted for in the future," Lin said, "but the tide component doesn't change with the climate and so the increasing trend of flood frequency will be similar." There is still much debate about whether hurricanes are becoming more frequent and intense. "But even if storms occur at the same frequency and strength, our estimates suggest the frequency of high storm surges will significantly increase based on rising sea level," said Lin. "As we refine climate and hurricane dynamic models, we will have more accurate predictions that will allow planners to better design flood mitigation strategies." Rick Luettich, a professor of marine sciences and environmental sciences and engineering at the University of North Carolina, said that the research represents another important step toward quantifying the risk of storm surge and associated flooding in the coastal New York and New Jersey areas, both today and during the remainder of the 21st century. "This information is critical for enabling well informed decisions about the future of this region," said Luettich, who was not part of the research team. "One wonders whether this area would have developed into the megacity it is today had its early years occurred under the storm surge conditions predicted for 2100." In addition to Lin and Horton, authors on the paper include Robert Kopp of Rutgers University and Jeffrey Donnelly of Woods Hole Oceanographic Institution. Support for the research was provided in part by the National Science Foundation, National Oceanic and Atmospheric Administration, and New Jersey Sea Grant Consortium. This paper is a contribution to The New York Panel on Climate Change (NPCC), of which Lin is an active member, Palaeo-Constraints on Sea-Level Rise, and International Geoscience Programme Project "Sea Level Change from Minutes to Millennia."